The utility easement needs to remain clear of vegetation, rocks, fences and other objects in order for Jump River Electric Cooperative (JREC) crews to access power lines and underground equipment without any hindrances. In addition, the grade of the ground should not be altered around the pedestals and transformer boxes without prior coordination. Having accessibility to power lines and transformer boxes/pedestals is essential for JREC crews. Clear access enables crews to safely perform routine maintenance and restore power as quickly as possible during a power outage. Trees and vegetation interfering or growing too close to power lines (in the utility "right-of-way") can create a multitude of inconvenient and dangerous situations, including damage to equipment or vegetation, blinking lights, fire threat, power outages, and safety threat to the general public. 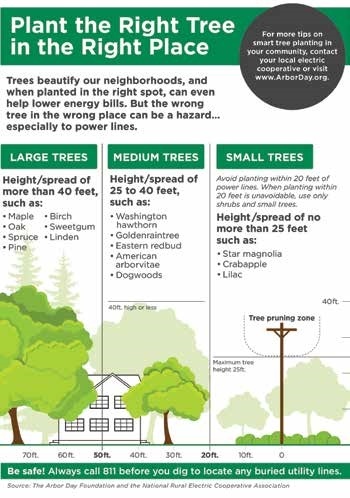 Plant and tree growth also create an easy route to the lines and equipment for children and wildlife who do not understand the potential danger of the power lines. We are dedicated in keeping our members, the public, and our line crews safe. 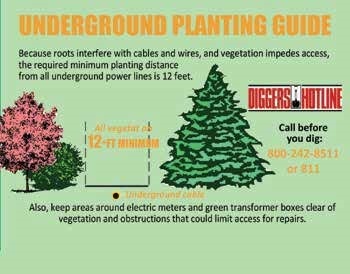 Please assist JREC by planting vegetation and by placing other objects out of the utility easement. Jump River Electric Cooperative thanks you for understanding how important this message is. Any questions, please contact our office at 715-532-5524.